My regular readers know all about my love of casual entertaining. I’ve posted examples of it before, and mentioned it dozens of times in passing. 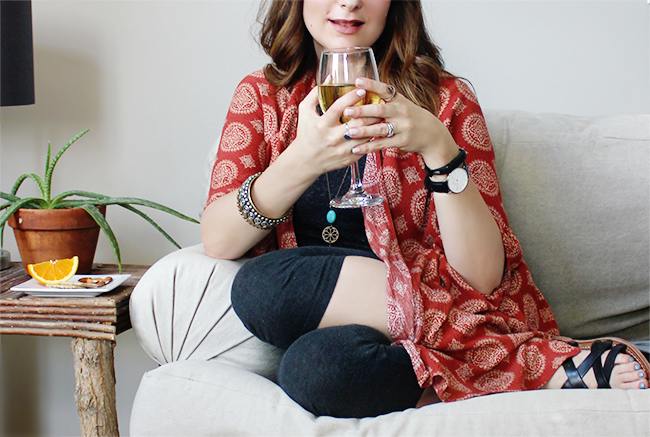 While putting together the occasional big fancy party can be fun (I’m talking every few years, tops), I prefer to host more laid back gatherings with close friends where we can all relax and just enjoy one another’s company. I’m admittedly a planner even when it comes to the most casual of events, but there are times when there isn’t advance notice to allow for preparations. 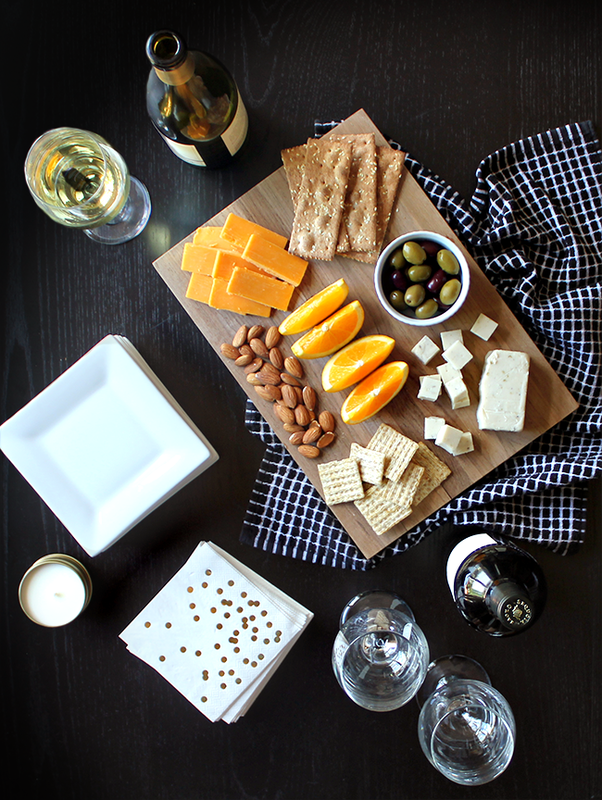 Thankfully, when it comes to the casual entertaining style I already enjoy, there are easy ways to put things together and create really great hang sessions, even when they’re last minute. I recently had a couple of friends who called to let me know they were in town for just a few hours while on a layover, so I pulled out a few things I had around the house for refreshments, and we ended up having the best time. Today I thought I’d share what I did, in hopes it might inspire some of you the next time you need to entertain without much notice. You guys are well aware of my fondness for party trays (I’m pretty sure I’ve shared at least three variations of them with you over the years), and that was the first place I started. Part of the reason I’m such a fan is that you can put them together in a pinch with whatever you happen to have sitting around your house, in a way that still looks visually appealing. I sliced some oranges, cheddar cheese, and vegan jalapeño cheese, and arranged them on a wooden cutting board with olives, two types of crackers, and some almonds. In five minutes I’d created a delicious snack for my friends without having to run out and grab supplies. Next I grabbed a couple bottles of wine from my pantry. 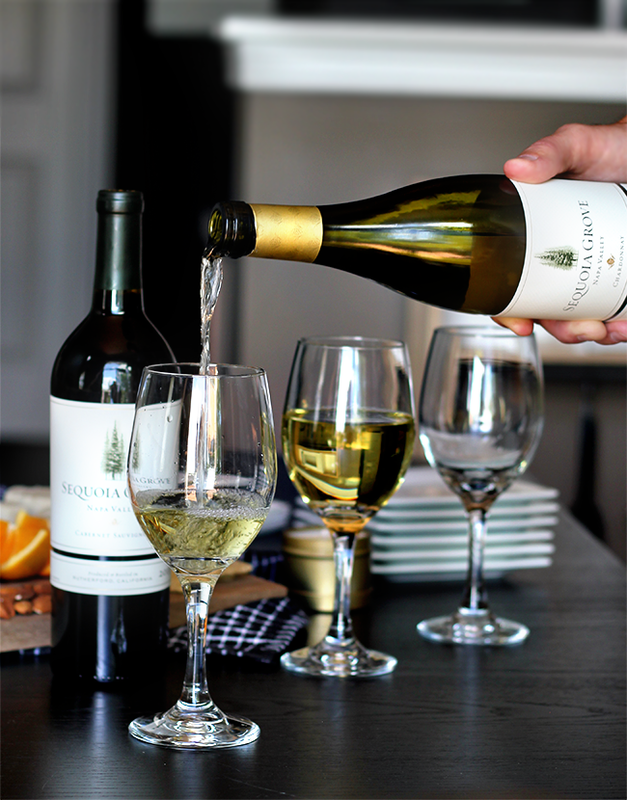 Having great quality wines on hand is key to taking last minute gatherings up a notch, guys. 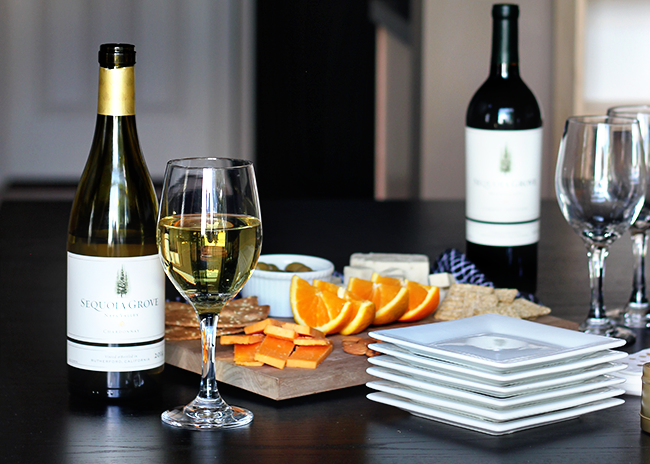 One friend prefers white and the other red, so I chose a Chardonnay and a Cabernet Sauvignon from one of my favorite wineries, Sequoia Grove. 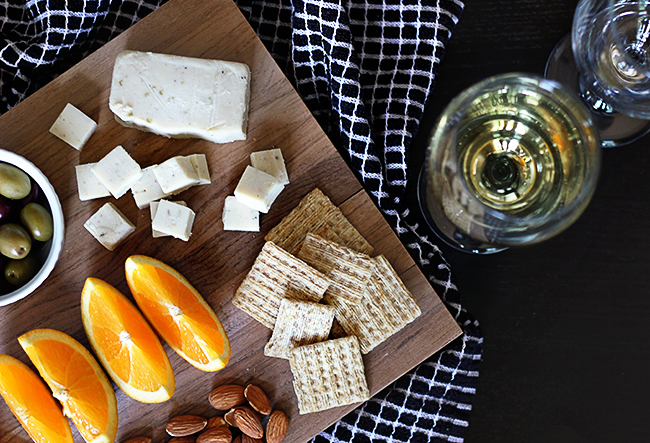 Both varietals work nicely with the snacks I had on hand, and each has its own unique characteristics that make it delicious. I also love that Sequoia Grove winery (which has been around since 1979) is family owned, with a tasting room that is nestled into one of the last remaining groves of the majestic Sequoia sempervirens in the area (because y’all know redwoods hold a very special place in my heart). 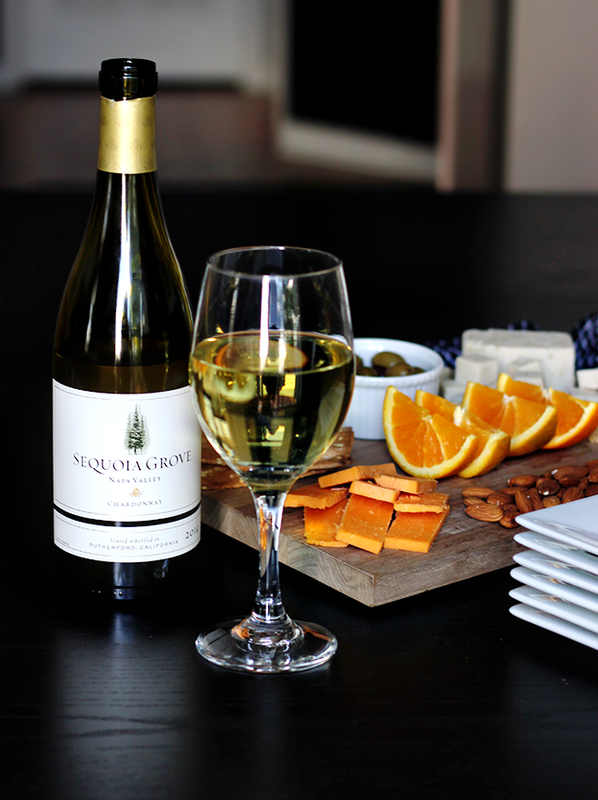 I’m not usually a white wine person, but their Chardonnay is probably my favorite wine for summertime. It’s so, so good. Finally, I arranged the party tray on the dining room table along with some wine glasses and small plates, some pretty napkins, a candle, and a small flowering plant from my deck (instant floral centerpiece), and voila – instant afternoon tea party for grown ups. I have two very young children and I work from home, which translates to the fact that I am a hot mess more often than not. But when it comes to last minute entertaining, I’ve learned how to make it work and, you know, at least appear to be channeling a Martha Stewart vibe. 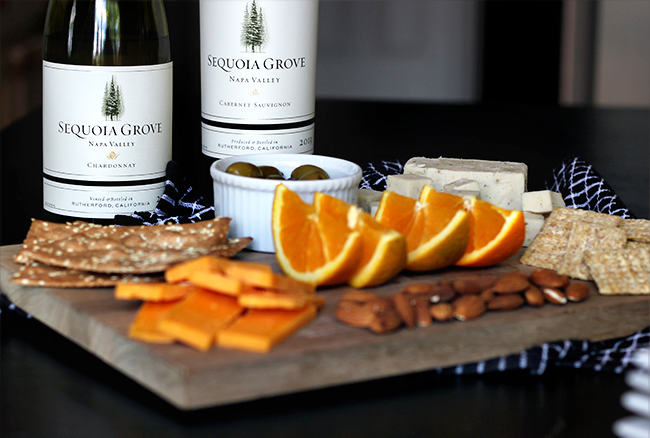 Just remember – all you need is a cute cutting board, some cheese/fruit/crackers, and a great wine like Sequoia Grove Chardonnay and/or Cabernet Sauvignon, and you’re set.